Sheets are soft and super cute! Very cute, pictures do not do this print justice. Appear to be well made, tight fitting on our king size bed. Absolutely worth the price. Love the look and the quality of the whimsical microfiber sheet with elephant print that will grow with my granddaughter. The sheets will work well in many different decor styles. 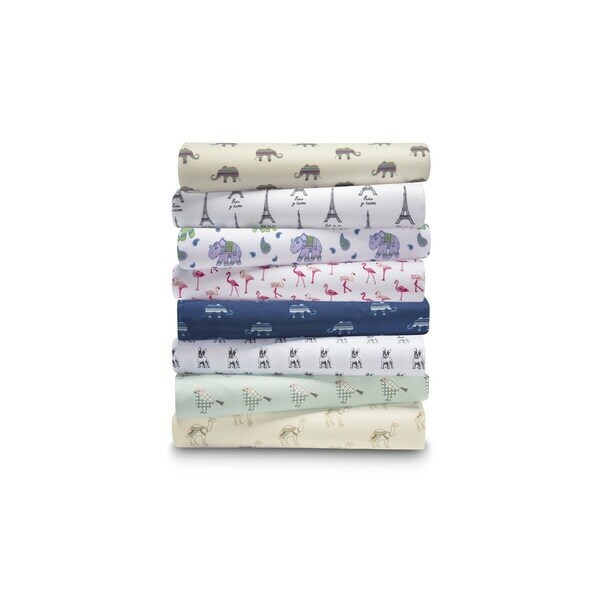 Super cute sheets -- HOWEVER - please note that they have listed both Twin and TwinXL sheets and the sku numbers are the same and the same size -- therefore these sheets do not actually come in TwinXL. Just love the way they make my bedroom look and feel. These sets of sheets that I purchased from Overstock are very nice and very comfortable. Since this is the bedroom, that I come home to after a very long day I need my bed sheets to be a key ingredient in the decoration of my room. When choosing my sheets, I try to coordinate the colors and shapes with drapes to match the flow of the room. I get creative and use one of these personalized photo quilts or woven photo blankets. Over all else, I try to stick to lighter, brighter color patterns. I never have been disappointed when ordering my sheets from overstock. I ordered at least 10 sheet sets and I love them all. Thank you for allowing me to review these sheets they are a must have. This sheet set is unlike any others I have. It is "whimsical" for sure! More importantly, the fabric is sooo soft. Laundered the sheets when I received them -- they look as good as they did when I took them out of the box. It's nice to have sheets with something other than flowers or stripes printed on them. Wish they came In other colors. I was very pleased with the sheets! They were super soft and have vibrate colors! I definitely will shop Overstock for all my sheets from now on! I bought two sets of the twin flamingo sheets. They are for an airbnb property. So, one is constantly in use while the other is being washed. They are very lightweight so they dry incredibly fast. Plus the whimsical pattern gets a lot of positive comments. "love the sheets, so cute, etc". I love that I can pop them in the dryer after washing and after ten minutes they are done. If you live in a colder climate, they may just be useful for spring and summer. They are very lightweight. That was what I was looking for. But, the pattern is the real star. I was so sick of plain and boring sheets. These make me smile everytime I change over the beds! Purchased a set of king and a set of twin. Paris and dog pattern soft and fit very well. These sheets aren't only attractive...they feel so good, so soft and I can't leave out that, also great price. What more could you ask for, attractive comfort and affordability! Nice sheets for the price - my daughter is using in college and she loves them! Ordered these for our granddaughters room and couldn't be happier. They're a nice quality fabric and the print is cheerful but not overly juvenile. Would definitely order again. Purchased the Paris pattern they are cute, washed them before putting them on the bed they came out fine. I love the design on this set. I feel as if I'm sleeping on silk. They wash really good and come out of the dryer feeling like brand new. Too good to pass up!! They are okay for the price but the colors are not apparent and the sheets are too thin. I love these sheets for the price. The feel really soft and fit my king size bed great. My bed is 11.5 inches and the fitted sheet pockets are deep enough to fit the bed perfectly. Love this pattern. Is is so adorable for my son’s room. The sheets are very soft and light for any temperature. The little elephants are adorable and make me happy. Plus, I like blue. Sheets are soft, but not too silky, and they let my skin breathe. These are my favorite sheets. Comfortable, not scratchy, light and stays cool. I purchased the teal bird pattern and was surprised by how bright the color was on this set. Washed over a dozen times and still hasn't faded. I bought this sheet set with the birds in light green. The pictures online don’t do it justice. It’s beautiful!! They are so so soft! I bought them for my daughter’s room. She has a lavender/pink/light blue theme. The sheets have birds with a touch of pink and blue in them, with patterned wings. She always asks for ‘the bird sheets’. They are perfect for year round use as they are not too heavy or too light. I wish I had ordered 2 sets. For the price I was not expecting them to be so soft and wonderful. The patterns on the birds make them expensive looking and I recommend them for any room or guest room. "How come the Twin and TwinXL are shown with the same sky and sizes? I ordered Twin XL .. received Twin .... they are 5" shorter than a Twin XL." This is a microfiber product made of 100-percent polyester and therefore does not have a thread count. Yes, the pillowcases are included. Yes, and they are super soft! "How deep are the pockets on the pink flamingo fitted sheets?" The pocket depth is approximately 15 inches. Ordered a set last month and loved them so ordered another set! "If I would choose the "pink" queen set. Would I be purchasing the flamingo print?"